January 2018 saw the launch of an ambitious fundraising campaign, with the aim of purchasing four new boats for UBBC. UBBC's coxless fours and pairs were all over ten years old and in constant need of repair and maintenance, so a campaign was launched to aim to provide a new racing standard boat of each class. UBBC Alumni members donated just over £33,000 in support of the campaign, which in addition to a generous donation from the Rutley family, saw the purchase of a new women's coxless four/quad, men's coxless four/quad, women's pair/double and men's pair/double. The boats are all Hudson Super Predators and convertible between sweep and sculling. UBBC have already taken delivery of three of the boats, with the fourth due to arrive over the summer break. Early fundraising efforts were spearheaded by the crew members of two of Gordon Trevett’s successful fours; the 2007 IV- (European Universities Rowing Championship, Gold) and 2010 IV+ (HRR Prince Albert Challenge Cup, runners-up). After recently completing twelve years at the helm of UBBC, the club would like to commemorate G's service by naming the new men’s four “Gordon Trevett”. UBBC are particularly grateful for the generosity of Graeme Coulthard (UBBC 1986-88) and Phillip Rodger (UBBC 1996-2000), who kindly donated the funds required for each of the women's and men's pairs. Thanks go to all of our members who regularly donate by standing order and Direct Debit, whose donations made a significant contribution towards the campaign. Thank you to Adam Mackenzie (UBBC 2005-09) and Seb Tjornelund (UBBC 2007-11) for leading this campaign, and to the University of Bristol Alumni Office for facilitating our larger donations. A list of donors who kindly gave larger one-off gifts are listed below and on our campaigns page. Phillip Rodger, Graeme Coulthard, Sam Browning, Adam Moss, Tamara Tsallagova, Seb Tjornelund, Pete Randolph, Edward Walton, Matt Steeds, Phil Williams, Martin Herbert, Ben Bathurst, Andrew Turner, Ben McSweeney, Matthew Ridley, Henry Sperling, Richard Randolph, Giles Gray, Charlie Lewis, Luke Stevens, Nick McNeil, Jeremy Fitch, Hugh Cooper, Adam Mackenzie. 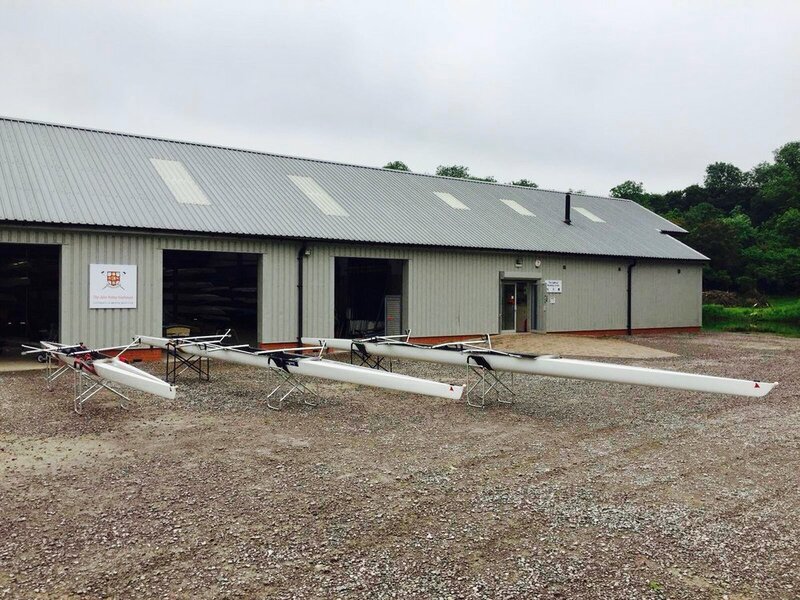 A naming ceremony for the boats will be held during the tea break on the Saturday of Henley Royal Regatta (7th July 2018). All members and supporters are invited to attend. 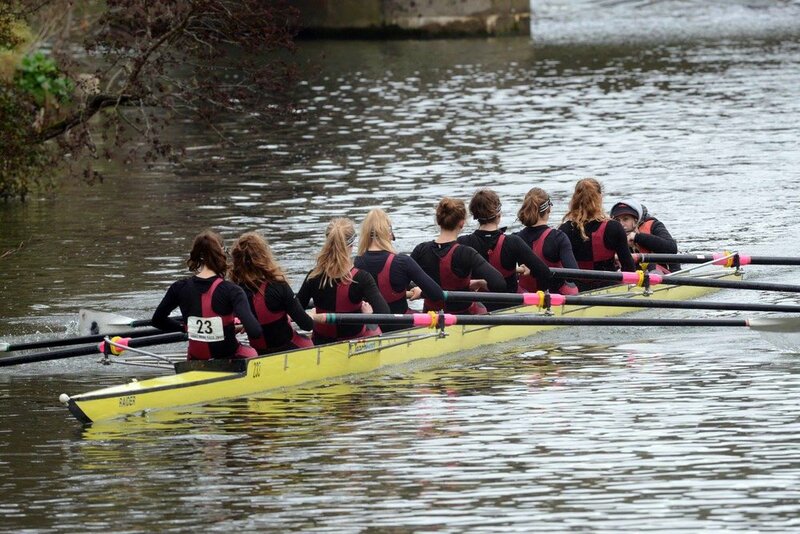 The University of Bristol Boat Club once again hosted a successful Head Race, with both UBBC and Nonesuch coming away as the fastest crews in every eights category. UBBC's Men's 1st 8 took the headship by 28 seconds, overtaking Avon neighbours Bath University approaching the final straight. UBBC's Women's 1st 8 affirmed their continuing dominance of the Women's Championship 8s event, taking the win for the third year running. UBBC displayed the depth in both Men's and Women's squads, also claiming victories in the Men's and Women's Intermediate Eights events. Nonesuch Boat Club fielded 3 eights; 2 men's and 1 women's, containing plenty of new faces to Nonesuch. The top men's eight and the women's eight both beat their counterparts from Coldharbour Boat Club (UWEBC Alumni), coming away as the fastest Alumni crews at the event. Following the day of racing, UBBC hosted the annual Head Race Ball at Ashton Court Mansion, where as per tradition pudding was eaten with no hands, followed shortly after by the pilgrimage to Lizard Lounge. The UBBC Alumni pass on our congratulations to Head Coach Cameron Kennedy and the whole of UBBC for a hugely successful weekend. 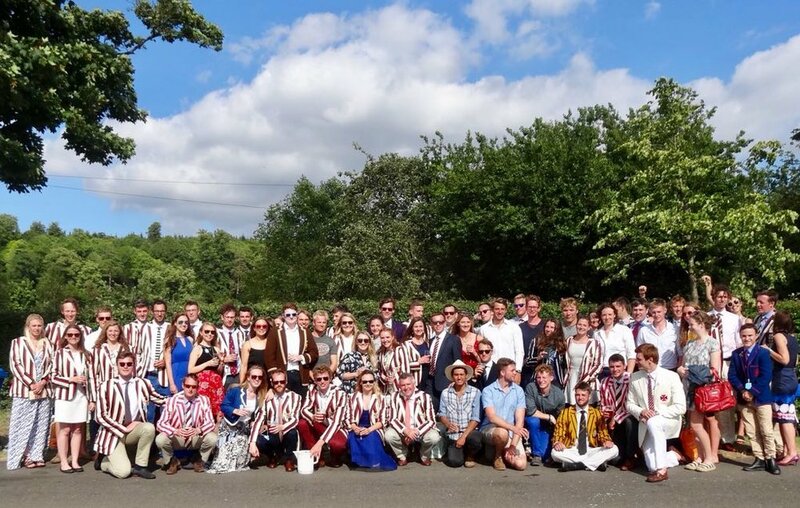 After the success of the 1991 Temple-winning crew reunion at Henley Royal Regatta in 2016, followed by champagne in the boat tents, a general consensus was reached that ‘fizz is a good idea’ - cue trawling UBBC records to find noteworthy anniversary crews as an excuse to host a similar drinks event in 2017, traditionally held during the tea break on regatta Saturday. It was a brief search, back just 10 years to 2007. Bristol did not win Henley that year, but the performances of the UBBC men’s eight were easily, and are still, strong enough to raise a glass to ten years later. No men’s eight has come close to repeating that level of performance at Bristol in the past decade - and for that reason alone… Cheers! At Henley Royal Regatta in 2018 we will raise a glass to the crew that won Henley Women’s Regatta in 1998. Until then, please take a moment to acquaint, or remind, yourself with the achievements of the 2007 UBBC men’s squad. The scene is set - after achieving a silver medal in men’s champ eights behind Oxford Brookes at BUSA (now BUCS) regatta in May 2006, the crew went on to pick up a bronze medal at the European equivalent event in early September 2006. They were again beaten by Oxford Brookes, who took silver, whilst a crew from the Czech Republic won the event held in Brive, France. 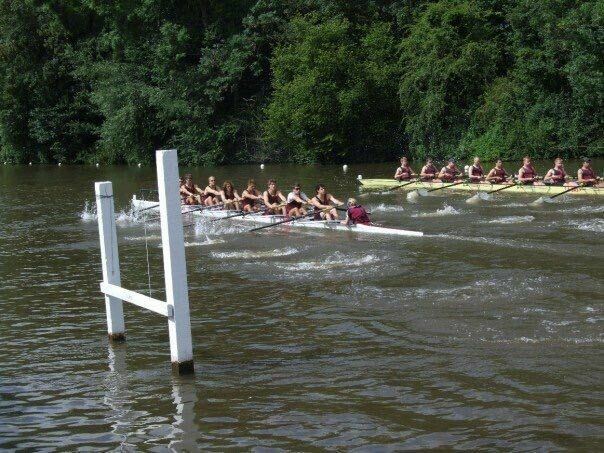 Perhaps it should be noted that OBUBC had also won the Temple and the Visitors at Henley in 2006. However, EUSA 2006 is perhaps best remembered for the short-lived ‘drinking blade’ which was a key participant in that evening’s celebrations. Another crucial result is that we beat OBUBC in an arm-wrestling challenge, which was finally decided by the ninth man i.e. the coxswains. Chapeau Simon Wilson. Winter camp - was held in Banyoles in the earliest days of 2007. We shared the lake with Cambridge University Boat Club and two crews from each institution raced on the final day of camp. A staggered start ensured some high quality racing in the final 500m, with the Blue Boat unsurprisingly taking the honours. However, the strong Bristol ‘A’ crew performance surprised many, and the impact of this unexpected early test featured in the sport psychologist Mark de Rond’s book about his year spent with CUBC. Cambridge went on to win that year’s Boat Race. Head of the River 2007 - was cancelled due to adverse weather conditions, but not before the first 50 crews had set off. Starting at 34, UBBC I had closed up aggressively on Molesey III in the early part of the course, before sinking just after Barnes Bridge. April - for the first time in five years, Bristol reclaimed the Varsity blade from UWE. 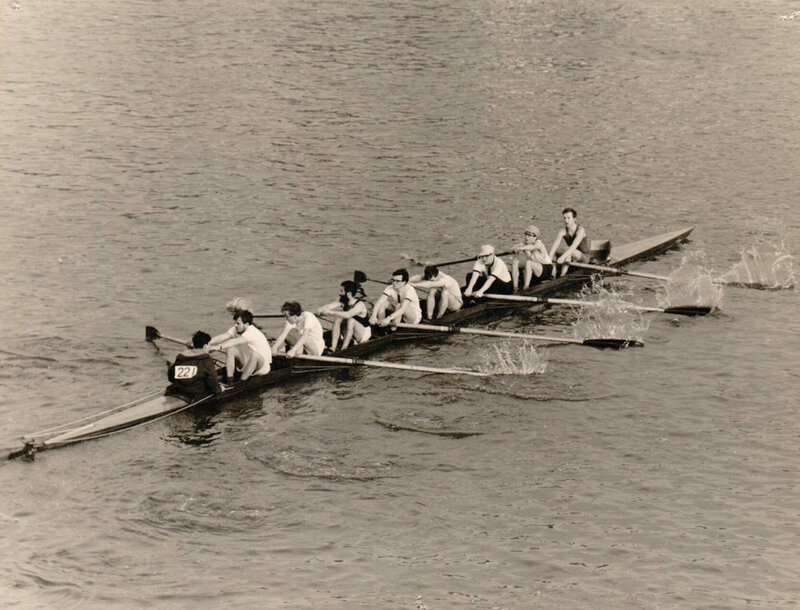 In the year before, the men’s eight race had been a dead heat, which was then rerowed with UWE victorious. In 2007, Bristol victories were largely recorded across the board, with us winning 4-1 overall. 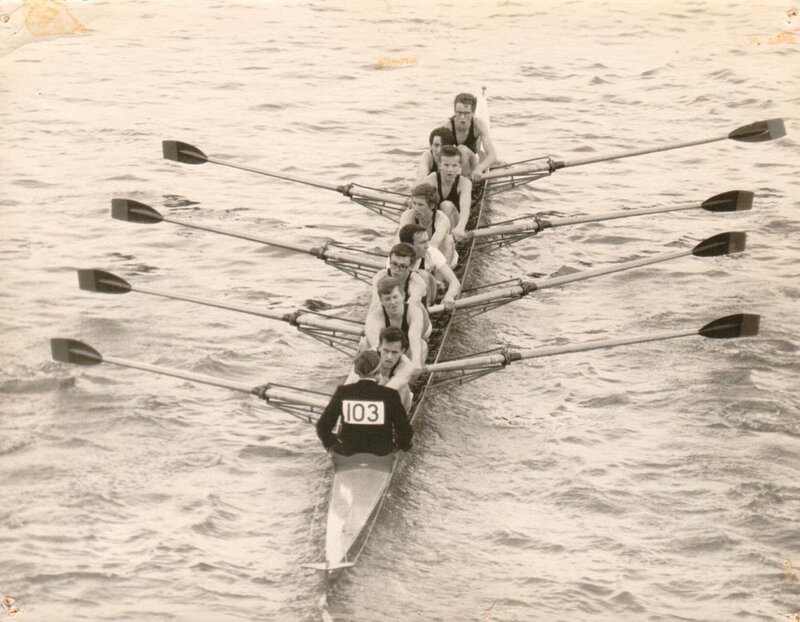 A photo of Martin Herbert, that year’s club captain, celebrating with all of the other club members crowded behind him, was used for many years on the ARA (now British Rowing) website to promote university rowing. May - an indisputably strong performance at BUSA regatta, although we finished out of the medals in Men’s Championship Eights. If an excuse is needed, the blame can easily be shifted onto the Holme Pierrepoint cross-winds. The standout performances here came after splitting the men’s eight into two smaller boats, where we won Gold in Championship Coxless Fours and Silver in Championship Coxed Fours. June - seat racing was required for the final seat in the men’s eight, as one of the crew (Matt Steeds) was ineligible for Henley due to his medal in a GB vest at FISU 2006. Matt rowed for Leander in the Ladies Plate event at HRR 2007. The result of a forced personnel change was most unexpected, as replacing the largest ergo in the boat with the fifth bowsider somehow made the eight go a lot faster. 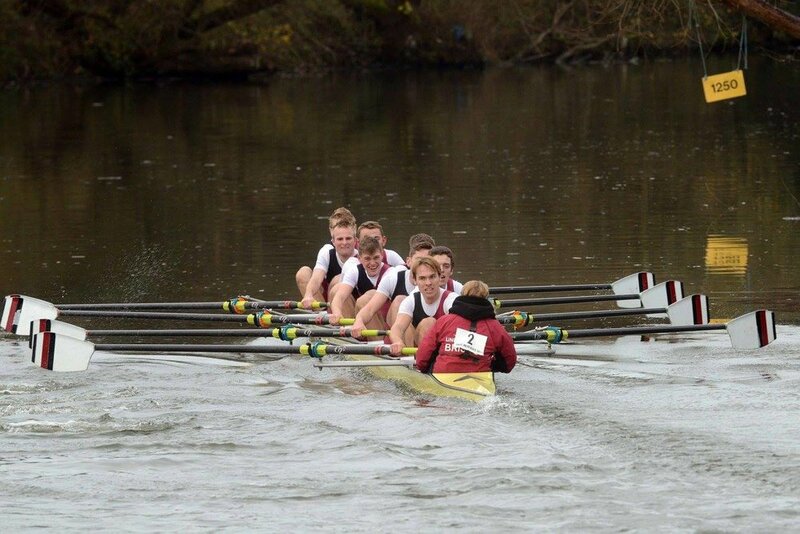 That crew went on to win S2 (now IM1) Eights at Metropolitan Regatta, and Elite Eights at Reading Amateur Regatta. Pete Randolph and Matt Steeds also won the Poke Pairs cup at Met. 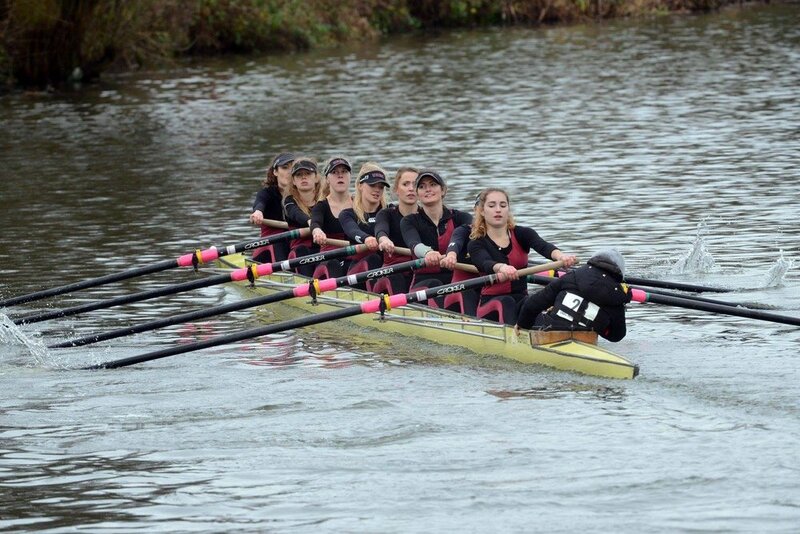 The winning streak finally came to an end when the crew came up against the Oxford University / Oxford Brookes composite crew (entered into the Ladies Plate at HRR) at Marlow Regatta - pushing them close, but finishing short by canvas at Dorney Lake. Pre-Henley 2007 - the annual UBU sports dinner. The Boat Club won an embarrassing selection of awards; picking up the Team of the Year (Men’s 1st VIII), Sportsman of the Year (Matt Steeds) and Outstanding Contribution to Sport (Martin Herbert) awards. Henley Royal Regatta, July 2007 - notable for the incredibly strong current on the Henley course. Swathes of the English countryside were underwater, and portions of the course had not been fully constructed due to the weather conditions. 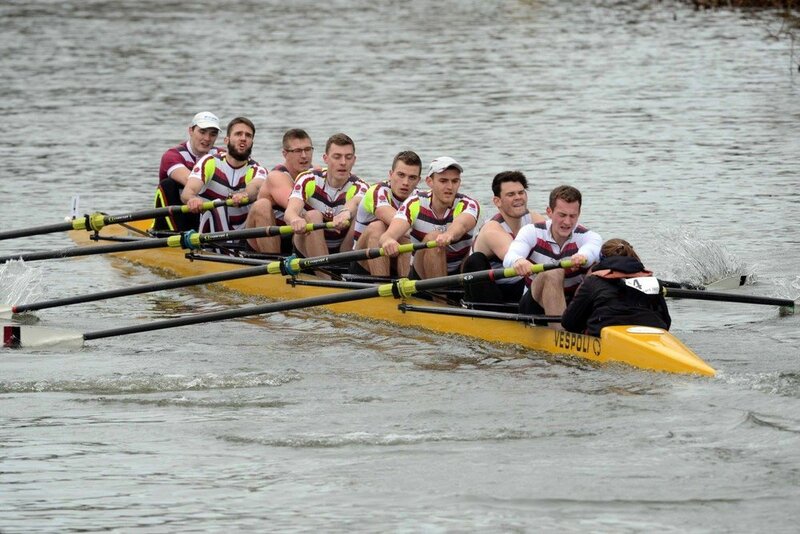 Having beaten all of the other domestic club and student-level men’s eights during regatta season, Bristol had rightly been selected as the fastest UK university crew in the draw. However, it would have to be done the hard way, by winning from the Bucks station each day until the final round - this proved to be a significant factor throughout the regatta, especially noted during the final ten strokes of each race. 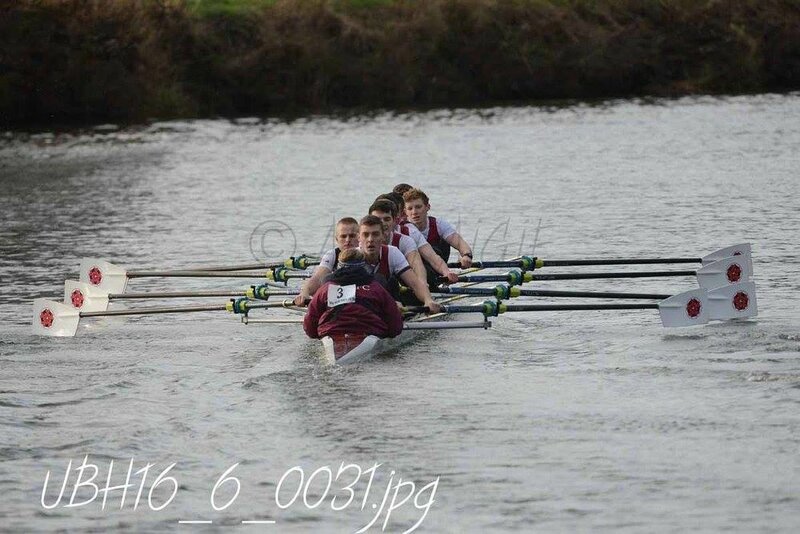 The crew were drawn against UBBC ‘B’ on the Wednesday, before dispatching with Oxford Brookes on the Thursday. On Friday, the crew faced the undefeated US Lightweight champions from Cornell. In a race where the lead changed hands multiple times, we were leading into and through the enclosures, however we were beaten in the final few strokes by a quarter of a length. Cornell were eventual runners-up, beaten narrowly by a freshmen crew from the University of California, Berkeley. Summer 2007 - a quartet of the squad stay in Bristol to train for the upcoming EUSA Regatta, to be held in Banyoles (Girona) in September 2007. 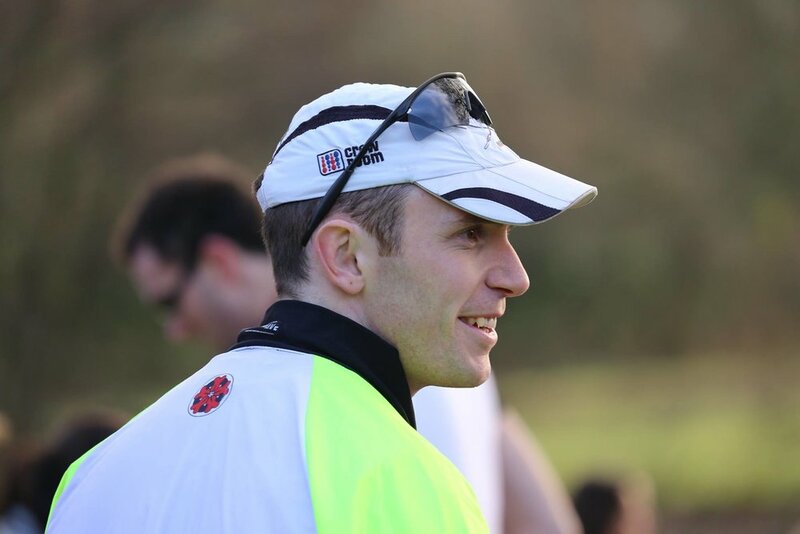 Pete Randolph (UBBC Men’s Captain 2006-07) is also selected as the stroke man for the GB U23 men’s eight. In Spain later that summer, the crew managed to beat everyone in the coxless fours competition, including the majority of a German national U23 crew. As a result of this achievement, Bristol Reds were awarded to Pete Randolph, Mark Roberts, Matt Steeds & Edward Walton. 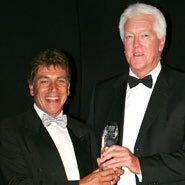 Later that Autumn - Gordon Trevett was voted BUSA Coach of the Year, in a nationwide competition. Here’s to the 2007 men’s squad. Cheers! The launch of an online shop, with new Member's Blazer Buttons available for eligible members. A successful BUCS Regatta for UBBC. Nonesuch Boat Club starts preparing for its 2017 summer racing season. 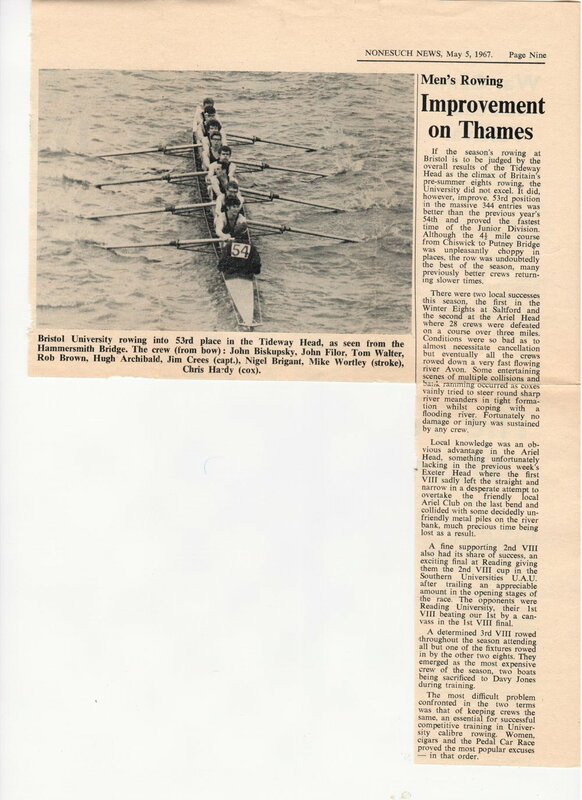 On 18th Feb 1967, UBBC competed in the Southern Universities regatta at Reading. 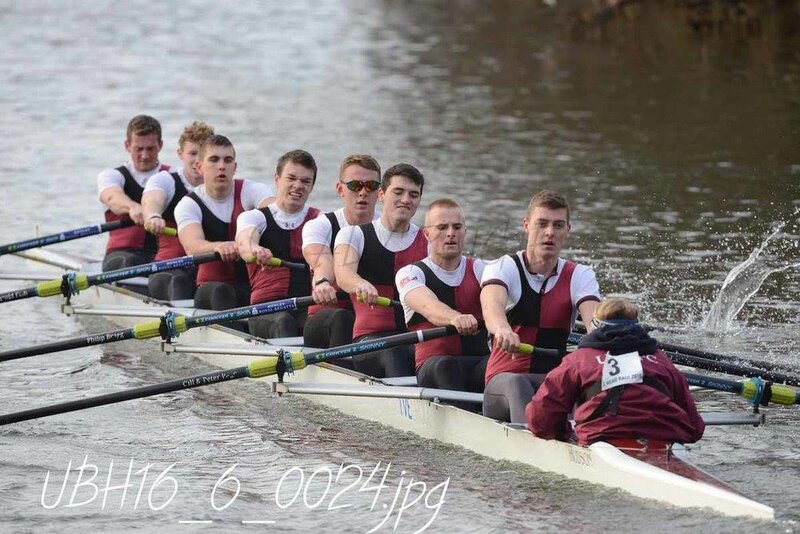 The attached photo is of the crew who won the 2nd VIII trophy. It is scary to think that it was half a century ago! I can still remember rowing at bow and pulling past Reading Uni 2nd VIII to win by 3/4 length. 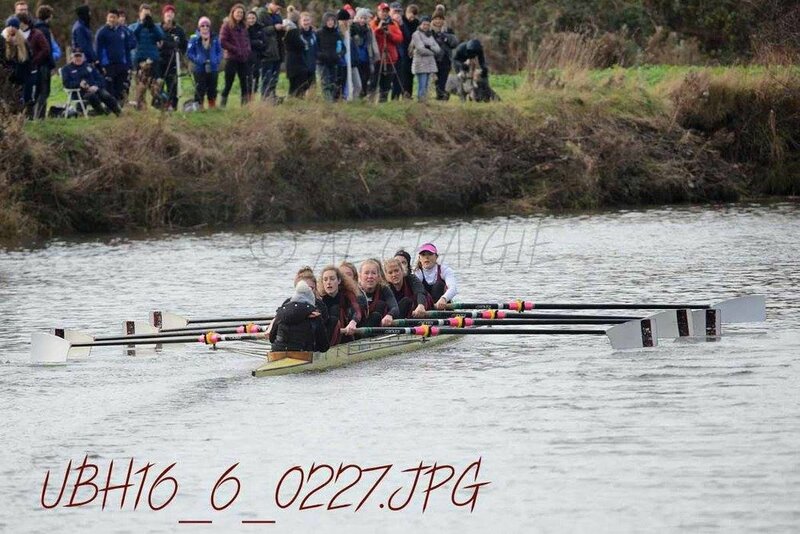 We had a row against the 1st VIII next morning and they couldn't catch us! We used to row from Saltford in Autumn Term, then move to St Anne's to the Bristol Ariel clubhouse for Spring term as the course available was longer. The disadvantage was that it was just upstream of several factories. The paper mill added a fine mush to the river and the tar factory an iridescent sheen and distinctive smell to the lower half of the HOR course. The bend by the boathouse was a coxing challenge and several visiting boats would crash each year. 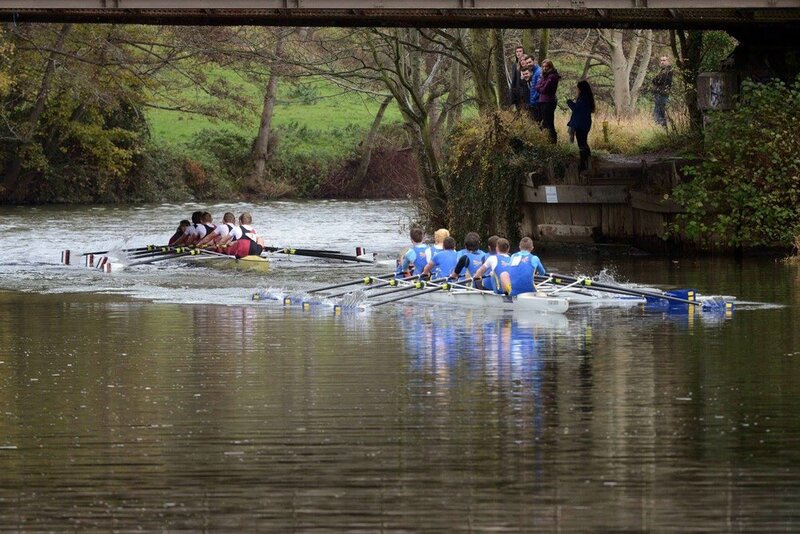 The Exeter HOR was held on the canal with 3 narrow bridges which could not be rowed through as the blades had to be shipped and one was on a right-angled bend where occasionally a crew would get stuck across the course stopping the race. Also, immediately past the finish there was a low narrow bridge under the Exeter by-pass as it then was. so one had to ship blade and duck head instantly after crossing the line at full speed. If you would like to share your memories and any photos of your time in UBBC, please get in touch via our email address ubbcalumni@gmail.com. 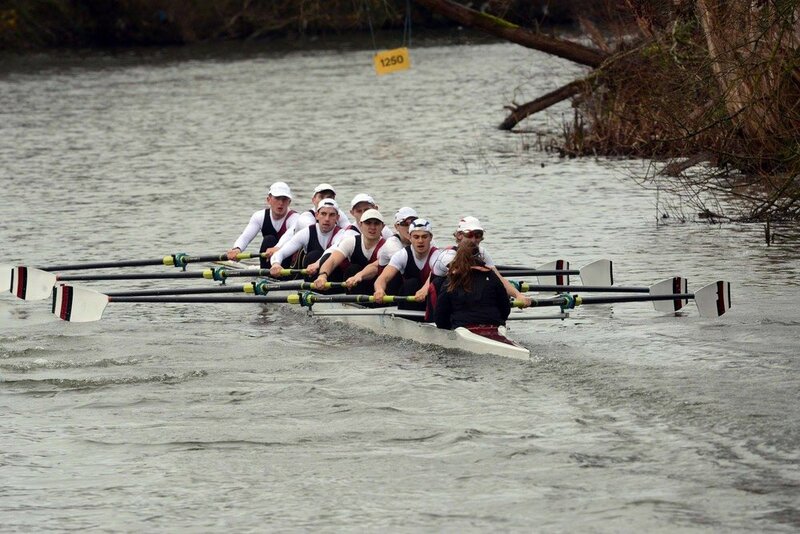 The UBBC Alumni were out in force at the 2016 UBBC Head Race, fielding a women's eight and two men's eights from Nonesuch BC, as well as supporting the current student committee in the running of the event. 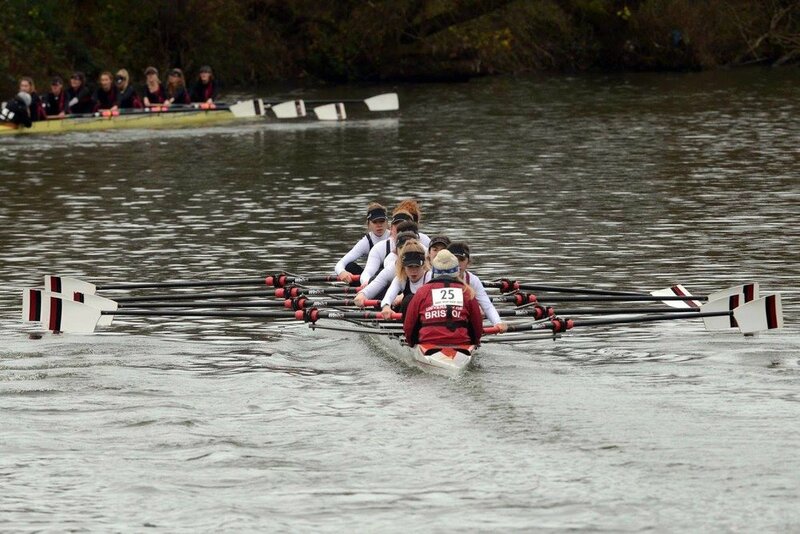 Women's Championship 8+ won their event, 37 seconds ahead of the next crew. Men's Championship 8+ placed 2nd in their event, behind a fast crew from Bath University. 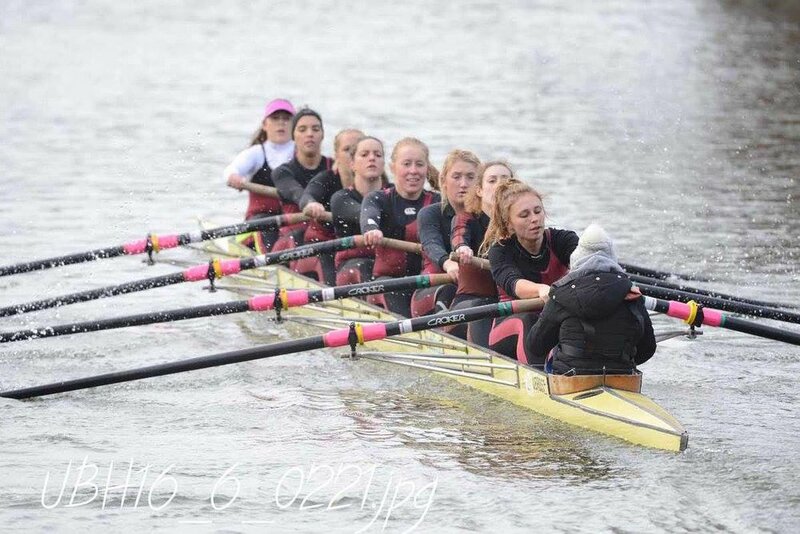 Women's Intermediate 8+ placed 2nd in their event, behind a first crew from Birmingham University. Men's Intermediate 8+ placed 5th of 9. Callum Gathercole won the short course Men's Championship 1x. Joe Harper and Harry Stroud won the short course Men's Championship 2-. 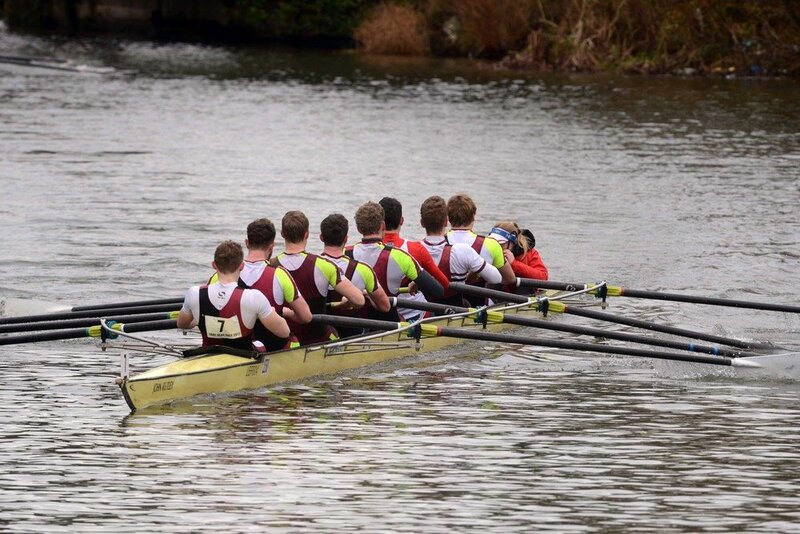 The men's 'A' crew posted the second fastest time of the day, but most importantly beating Coldharbour BC by 25 seconds, with the 'B' crew posting a time quicker than some current student first eights. The women fielded an eight, unfortunately placing last on this occasion. Plenty of alumni offered their support for UBBC on the day in the way of advice, donations and help with timing, marshalling and processing results. The day was rounded off with a lively ball at Ashton Court Mansion, where the UBBC Alumni rigidly enforced the traditional 'no hands pudding' challenge, before decamping to Lizard Lounge. The latest UBBC Alumni newsletter is now available to view online. The Winter 2016 edition includes interviews with Lucy Primmer, Chris Heywood, George Stewart and Ben McSweeney on their recent rowing successes, life advice from Piers Robinson reflecting on Bristol's 1991 Henley win, as well as Sam Salt's write up of Nonesuch BC's summer of racing and updates from UBBC. ers of the UBBC Alumni met for a dinner at the Royal Automobile Club in London. UBBC Alumnus Chris "Chewy" Heywood (2012-2015) represented Great Britain at the 2016 U23 World Championships in Rotterdam. Chris was selected into the stroke seat of the coxed four and reached the final, placing 4th overall. UBBC Alumni, Chris "Chewy" Heywood (2012-2015) and George Stewart (2013-2015) won the Thames Challenge Cup with Molesey Boat Club.